If you are planning to scrap out your old 200MHz PC with 64MB of RAM, and buy a brand new one, then there’s a buy one get one free offer going on. Buy a new computer get a home theater free and no conditions apply! Just Joking, its GeeXboX which will make your old junk machine transform into a powerful home theater PC. Its a Live CD based Linux distribution with a jaw dropping size of 8.9MB. 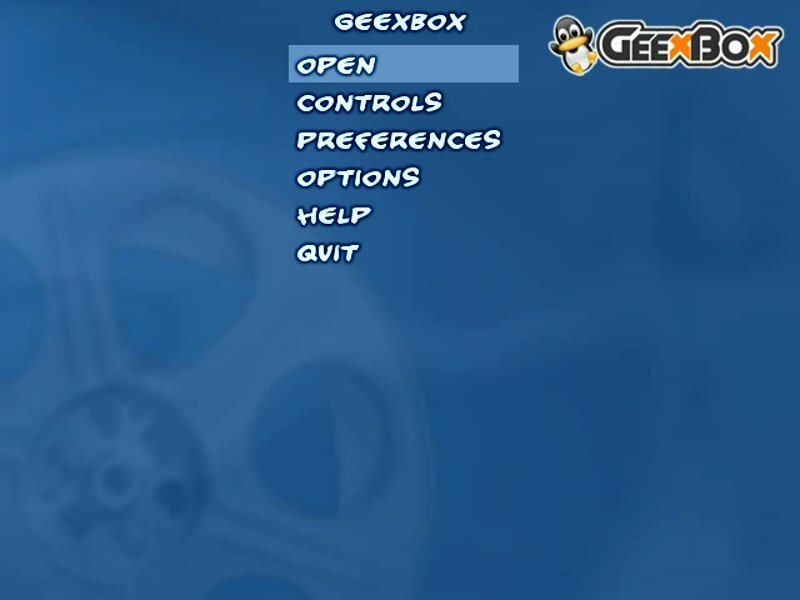 GeeXboX first development release was on December 2002. The project then was only capable of playing DivX movies. But it developed very fast and showed as the first public release on 16th May 2003 ( GeeXboX 0.90-1 ), which supported a lot of media formats other than DivX. This project was accepted in the Google Summer of Code 2007. GeeXboX is a Live CD Linux Distribution of a standalone embedded media player based on MPlayer. It directly boots from CD,USB drive. It completely loads itself into RAM, so it can run on even disk less computers! Despite its small size, its very powerful. It allows you playing 2 channel audio, video and viewing image files of almost all formats. It allows playing a media from the hard disk, CD, DVD,LAN, or Internet. It supports TV Out , USB, a variety of remote controllers, Joystick and keyboard for controlling. The only things you should have to run this awesome thing is a working CD drive. Currently it contains 72 packages which delivers various features. It automatically configures all hardwares, and boots up without any kind of setting, or driver addition. It supports MPEG1/2,DivX, XviD,H.264,Real Media, Windows Media, Flash, MP3, Ogg/Vorbis, WAV, AC3, DTS, MPC, FLAC and more formats. Supports WebRadio, WebTV, TV Out, playing files from LAN through Remote NFS, Samba, UPnP. In picture, supported formats are BMP, GIF, JPEG, PCD, PNG, PNM and PPM. It plays Single/Dual Layer and HD DVD ,VCD, Audio CD s. It can also play a movie CD/DVD ISO image file directly. You can make an image of a DVD and keep the .iso in your disk, and play it. Once the OS is loaded into RAM, any media containing audio,video or images, can be inserted and played. And above all it comes with an amazingly easy interface, with all needed functions and a full set of keyboard shortcuts. Ready-to-Burn .iso images are available. The best part of GeeXboX, is the feature for the geeks. An ISO generator can be downloaded for Windows ,Linux and Mac OS, with which one can graphically customize the GeeXboX parameters, add movies, music,pictures, add other codecs,fonts, themes, configure menus, options, and compile a personalized ISO with some mouse clicks. Make sure that your motherboard supports booting from CD, and you have enabled booting from the CD first,i.e the primary boot device should be CD. Change the boot device priority if needed. Keep the GeeXboX CD inside and reboot. After the CD boots you will be greeted the GeeXboX loading screen,and the OS is loaded and the CD drive is ejected within seconds. Its lightning fast. You can take the CD out and place a media to play from it. You will be presented with a short menu listed below. All controls and configurations for playing, music and video can be done from the menus. GeeXboX also supplies a great set of keyboard and remote shortcuts, which help to manage playing media with ease and speed. Some important keyboard commands are listed below. Navigation Up,Down, Enter or Right to select, Left to Cancel, Right to change values in some menu. File delete,and copy-paste can also be done. To copy a file,first select the file and press C to copy,then visit the destination directory press D (sets as destination). To delete a file,press R when the file is selected, then press O to confirm deletion. Be careful when you delete files. When viewing images press H and it will come up with a help window. You will find commands for image mode, like zoom, rotate, pan, and others. A Full set of commands for keyboards and remote controllers can be found in http://geexbox.org/en/controls.html. For tweaks, tuneups like, enabling post processing for smoother and better picture, and other information, check the Documentation page. Check out the FAQ, the Wiki and the Forum section for even more. Installing GeeXboX in USB drive will delete all data inside. So back up the data before you do this. Plug in your USB drive, keep pressed F1 when the CD is booting. You will get a screen (check out for more tips in this screen) with some information, and a prompt at the bottom. Type in “install” and press Enter. Then follow the instructions. Be careful, and make sure you select the USB drive. When installation is finished, you can copy back the backed up data (movies!). By same process a separate Linux partition in HDD can be created and GeeXboX can be installed. The Current version 1.1 kernel v2.6.21.3 was released after almost a year after the 1.0. But the development is going one, and the developers expect that the next updates will come soon. Currently it officially supports 32 bit computers,(It ran successfully in my AMD Athlon64 X2, except image viewing).The team is now working hard for the next version 2.0 which will come soon. GeeXboX 2.0 would use the Freevo, a linux based open source HTPC platform. Check http://freevo.sourceforge.net to know about Freevo. Future updates would come up with more features including those in Freevo, support for 32 and 64 bit platforms, HDTV full native support (currently at beta), more codecs, optimizations, and would be faster (Upto 15%). No mouse support is in the current version, and is unlikely to be included on the 2.0 version. There is a technological preview of GeeXboX 2.x which can be downloaded from http://www.geexbox.org/%7Eben/v2/geexbox-sherkhan-20061231-en.i386.iso. This release is about 20MB and needs at least 128MB RAM,and has limited functionality. This is for testing purposes only and should not be mixed up with an official release. For future the GeeXboX team is thinking about porting GeeXboX into Sony Play Station 3. This small and fast,open source, easily customizable distro booted from CD or USB drive, with a simple interface, which supports all (almost) media formats, runs even in the lowest hardware, can be carried in a USB drive along with songs, and movies,which can boot in any computer. It has a potential to make itself a dedicated and a portable media center, and transform any machine to a HTPC. In future GeeXboX along with Freevo, has a high probability of being a full powered embedded media player. Geexbox 1.2 with a lot of changes upgrades and additions, has been released officially and is available for download in the GeeXboX official website. I will update this article soon after i try and test the new release. So for now please visit the official site of GeeXboX and get the information there. Linux is only and i repeat only for ”SADOMASOCHISTS” – people that enjoy in hurting them self by trying to fix unfix able things that developers are sometimes intentionally not provide due many reasons ! You can advertise Linux as much you can but the truth is that people are running away from Linux by the first negative experience ! And Linux has plenty of it ! The first of such is Linux bootloader many times problematic non workable no proper installable and by the hand editable that many people find anoying and not needed (in compare to win bootloader works flawless just about every time not so win os) and second various Linux installers that dont do the job properly ! Lately i have try to install geexbox to hd but no luck ! Non stop notorious problematic Linux childish disease not overcome’d as to to day ! Someone capable to develop such app os and then misses to provide proper installer is to be not use worthy ! Making others life miserable ! And that i mean is sadomasochistic ! I give up on Linux ! Even strong purpose for what is Linux good for is not working as advertised and promised ! I intend to use some old computer for multimedia purpose but developers doing such sloppy work it’s unbelievable ! Go to the store and buy some Digital TV with usb and sd card support for 200-300 euro and enyoy watching movies from hd ! Yes it’s linux inside, but i’m getting for my money workable device with 1 to 2 years guarantte not so with posted app and OS-ses all over the net ! Its not worthy to lose time energy nerves and getting gray hair on it ! And then is there so called frugal install – just another invention to make live with linux hard as hell ! And then all over the place howto’s that aren’t working or not fixing problems taht developer misses to fix ! As i see it with howto’s Linux developers are hiding their incompetence ! Thus so many people are using Linux ! My advice go to store and buy for your money some mutimedia device ! They don’t sell non workable ones ! One is far more better of problems as with such posted Linux distros ! There are few that are working all the time but no interest to me like ubuntu mandriva suse and fedora but Linux is far from being user friendly and posted solution aren’t doing for what are intend to do like GeexBox and some others to ! Look at net, complaints all over the place ! Don’t bother with Linux you get only headache gray hair and some year of shorted life ! If its not working first time then in 99% would not working in second and further ! And then someone advertise such sloppy work ! I don’t get it. If Linux is so good why is so problematic then ? Open source must be problematic one otherwise MS would not sell or what ? In some sort of hand in hand conspiracy from commercial to open source and back ! I have an opposite experience. I used Microsoft Windows previously, which had a lot of problems and was annoying. Someone suggested linux, specifically Fedora. Now since last 5 ~ 6 years I am working on a Fedora system, without any problems. If there is a software then there would be problems. It applies for every software. Some softwares are under development, and not finished yet. If you use relatively matured software, you will hardly find any problem. Not all Linux distributions are good, that is why there are reviews and users try them. For me Ubuntu didn’t work, therefore i don’t like to use Ubuntu, but Fedora is perfect for me, therefore I am using Fedora. For the usage of Linux, possibly you wouldn’t even know when you are using Linux. A lot of mobile devices (Android) have Linux inside silently. A large amount of supercoputers around the world run on Linux. For the desktop market, people either doesn’t like to shift to something new because they simply don’t like to move, or if moved to some new OS doesn’t want to fit in. Thanks for dropping by and for the detailed comment! I think you need some sleep and cool down :D . What i can say to you is, try to love Linux and she will love you back.